So roughly 10 months after breaking my foot... and 1 year since I'd entered any kind of race, and about 2.5 years since I'd run a half marathon "healthy" and about 3.5 years since I'd run a half marathon actually healthy :) I found myself lining up to start the Alexandria Half. Yeah, it had already been a long fight to get there. But that journey, it's soooooo boring. In fact so boring, I haven't updated my blog in a very long time. All I know is that I'm tired of being the girl who is injured. I just wanted to run again. I just wanted to be part of a race again. So I put it on my calendar. Somewhat followed the great plan by my coach. (eh, life happens, and I wasn't training for 140.6, so I'm struggling to prioritize the workouts again.) We'd reached a long run of 10 miles that felt great, if a bit slow. I was a good little girl and stayed in Zone 2 even though it had me running a good 2.5 min slower per mile than my old marathon pace. After being injured for this long, it's a lot easier for me to leave my ego behind. And then the penny dropped... some strange knee pain that I've never felt before in my right knee. This weird almost "locked up" feeling. And so I stopped running. I went straight in to see Dr. Kevin Maggs (so lucky to have them so close by!) and I said "WTF!!" you know... "well, that's fantastic!" Well, knee pain or not I was going to go to the race and finish, period. First Endurance Recovery for breakfast and 1 banana. Because I'd trained all long runs in Zone 2 I hadn't had any gels or sport drink in any workouts leading up to the race. I went back to my old half mary nutrition plan, Powerbar Gels, 1 Gu Rocktane for mile 9 and salt tabs just in case. I would drink water on course. The other big decision was which shoe to wear. 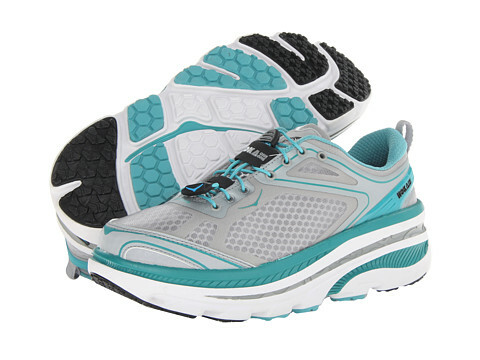 I'd been running in Hokas and I really liked them because my previously broken foot felt good in them. It hurt - just a little bit - to run on that foot for so long and the Hokas were the only shoe I COULD run in for awhile. But I was coming from running in Newtons, and I just felt like I didn't have the same foot speed, turnover in the Hokas. So I was trying Altra Torins, and they felt really good under my feet. But I'd only just bought them and had probably run a total of 5 miles in them... meh, I took a chance and went with the Altras. Overall, the race was a fairly small, localish race through the streets, parks and running trails of Alexandria. Very beautiful, and a nice way to spend a sunday morning. This is not a PR course, as the trail is at times tight and you can get stuck behind some slower moving folks. There is also about 2-3 miles of it on unpaved road. Enough hills to keep things interesting out there, but nothing that killed you for the rest of the race. The weather was perfect (for me) started at about 70 - probably up to 80 by the end of the race, but not very humid. Mostly, I just loved being out there with other runners! My legs felt really good for about the first 8 miles or so... I was running faster than I expected and just kept chasing my 2:00 goal. I did walk some aid stations, just because I've found my body responds better to taking a moment to drink the water, and then start running again. These little stops probably total 1:00 in overall time, but I think it's a wash, because I always run more efficiently when I start up. Almost like I've hit a reset button. Guy: Yeah, me too. You work late too last night? Guy: Oh, that kind of late night. 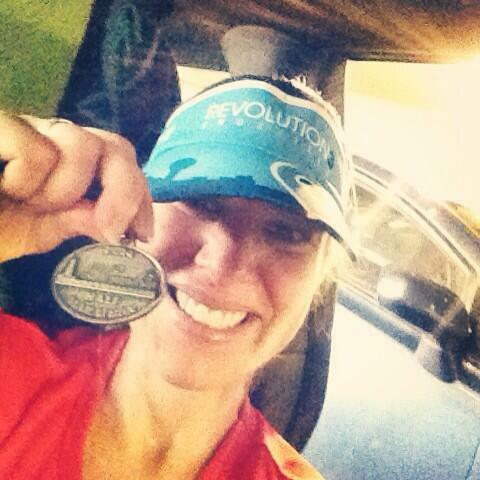 Finished in 1:53 - so 7:00 faster than goal time and SO SO SO proud of myself for making it happen. I know I'll be back to form soonish :) As soon as I can remember how to prioritize workouts over wasted time... That's the real trick here, getting my head back into "training" mode, making sure I get the workouts in, not making excuses, finding the time, doing it right. Long term - I'm still planning to chase the sub 1:40 half, and eventually I want to claim sub 3:20 marathon... I know I'm getting older, but I have plenty of role models to show that it doesn't mean I have to get slower. Hoping to get back to Boston.... Someday I want to run 100 miles... but I think that's for when the boys are a bit older. ...and I'm starting to rekindle the burn for the the 10:30 140.6.... There is a lot of work before I'm there (as in, maybe just finishing an olympic haha) but I'm starting to mentally prepare for the journey! Cheers to all! Happy Training and Racing!